So let me start off by saying, that i started this book on April 11th, 2012 and now we are in July. What does that say? In a few words it is not a pleasant notion, I usually don’t take 3 months to read a tiny book like this…unless something happened. While it did leave me to be entertained I seemed to have lost my way and interest for this book. I also keep checking my Good Reads account and see it to yet to be graded and that irks me a little too. So I decided that it was time to plough through my last 10 chapters of this book and let you know my final verdict. This story is about a young lady name Tish who has lost her way like I have lost my way with this book. After suffering an abusive relationship she struggles to come back into her own and no longer be that caged bird. She has a deep relationship with her grandmother whom she takes care of and a passion for old artefacts. During a visit to shop she finds a locket and instantly feels a connection—as if was meant for her and could not leave it. imaginable just didn’t sit well with her, but I found it amusing so I kept reading. Our male lead is none other than Criminy Stain, master of magic and of a circus group. I liked him because I’m usually stuck with the brooding male leads, but he instead he gave me quirky with a slice of dark…at time cynical but I loved it. Tish was so modern and acted in a believable way that I started devouring this book. Sure, she got whiny and yes there was another male lead (Casper Sterling = yummy) which undoubtedly created that triangle because they were so different but the same too. So I endured and endured and endured till the plot start to unravel where we meet the bad guy and finding out that he took got stuck in the land of Sang, but has a huge grudge against Trish and her blud friends. Oh and I forgot to mention, our damsel in distress acquired an ability…to see into the future yay!!! She has some usage besides just being pretty. The adventure to recover her stolen locket (which allows her to travel between both worlds) I think that’s what really slowed me. It was taking too long; I didn’t need to know something I just felt like Delilah was putting in words to think of how everything was going to work out. Also, the whole time they were in danger, never did it get serious…it just seemed like a joke and gave the impression that nothing too terrible would happen. When I thought they would finally get to Jonah Goodwill and put him out him out of his misery…all I got was more adventure and more secrets. And all I was screaming was knock it off already!!! …fair, let’s just say you know expression you can’t have the cake and it too? Well for Trish she definitely can and is very happy. BUT right when it seems to be all concluded, we get another vision, a vision describing a future that has yet to pass…dun, dun DUN so the adventure lives on. So my advice if you choose to read this book, don’t let 3 months pass by, it just harder to get the job done, especially if you are like me and cannot NOT finish a book no matter what the circumstances. 1) Coraline : This dark story still gets me look behind me, I really enjoyed the moment when she went through the tiny doorway and it just seemed very real. 2) Sister Red : The fight against the Fenris, golly I scrunched up my face during their battle scenes and I should clearly see Scarlet’s ax flowing in the wind as it took a chunk out of her enemy. 3) Across the Universe : The whole life on the ship and the fild like atmosphere especially when Amy, who was needed an escape just started running and the grass that never ends, went on for miles it seemed. 4) What’s Eating Gilbert Grape : The whole small town scenery was fantastic; you know that feeling that everyone knows everyone? Well I felt exactly that and believed I was there watching things unfold. 5) Whiter : Before Rhine got taken away, the dystopian world she lives in is crumbling it was hopeless, dark and lonely. 6) My Name is Memory : The whole process of the lives Daniel lived as he looked for his Sophia, I could never doubt the things he saw and lived through, from being a soldier recovering from fatal wounds, to a little boy in church meeting his first friend. Loved it. 7) Discovery of Witches : Although I’m nearing the end, this author knows how to write, so much detail in every scene. I especially loved the time Diana spent in the mornings rowing on the lake it was serene, peaceful and delicate. When she was relaxed I was too. 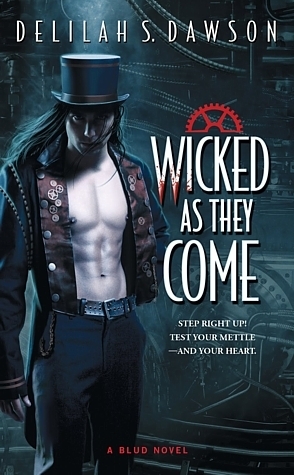 This entry was posted in 2012, Memes, Reviews and tagged Book Blog, Book Reviews, Books, Delilah S. Dawson, Meli, Tangy Marvels, Top Ten Tuesday, Wicked As They Come by dreamingwithink. Bookmark the permalink.